Yes! O’ Coffee club just had a revamp! Not only that, ALL-DAY breakfast is now available at all 12 outlets in Singapore! Egg Benedict [$10.90] – Choice of : Smoked Salmon, ham or Mangalica Bacon Yes!! Egg Benedict for only $10.90 and it was really good! Smoked salmon has the right balance of smoky, sweet and salty while bacon was so crispy and not too salty. Beside the two perfectly poached egg, what impressed me was the ciabatta bread that was soft yet crunchy! This is definitely a must try! 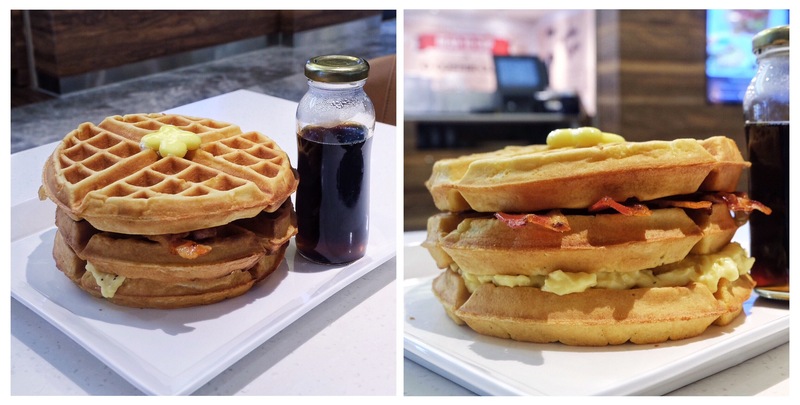 Waffle Stacker[$19.90]- choice of coffee maple syrup , gula melaka cream or normal maple syrup Live up to its name, generous amount of mangalica bacon and scramble eggs are filled in between 3 tiered brown waffles and topped with knobs of butter. The portion of this dish is huge and it would be better to share 2-3 people, unless you are a waffle lover and you can have all by yourself! French Toast [$7.90]- choice of coffee maple syrup or gula melaka cream French toast lover anyone? Golden brown pieces of fried Pullman French toast served with orange-infused Mascarpone cheese, drizzled with gula melaka cream! The toasts were soft and fluffy and it went well with gula melaka cream. I am a lover of mascarpone but orange infused is a little too much for me. Country Pie [$12.90] Chunks of chicken, carrots, onions, garlics and celery in a white sauce topped with mash potatoes , this country pie is indeed a comforting food! Dip the crispy toasted paprika tortillas with it to make it more shiok! Muddy Mud Pie [$11.90] Consists of a duo of cappuccino and chocolate ice cream on a chewy cookie and cream base topped off with a drizzle of chocolate sauce and oreo cookie crumbs, how to say no to this sinful yet awesome dessert?! Frozen Espresso Latte [$6.40] Spot that penguins and polar bear out! 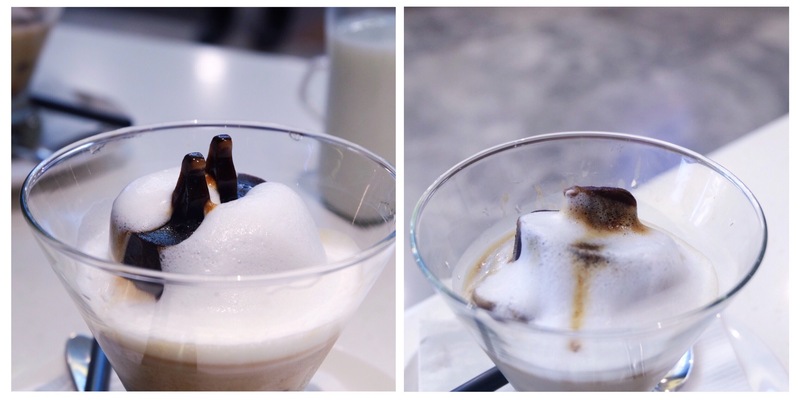 Espresso latte that comes with a polar bear and penguin shaped espresso ice cube topped with warm milk, definitely a must in this hot weather! 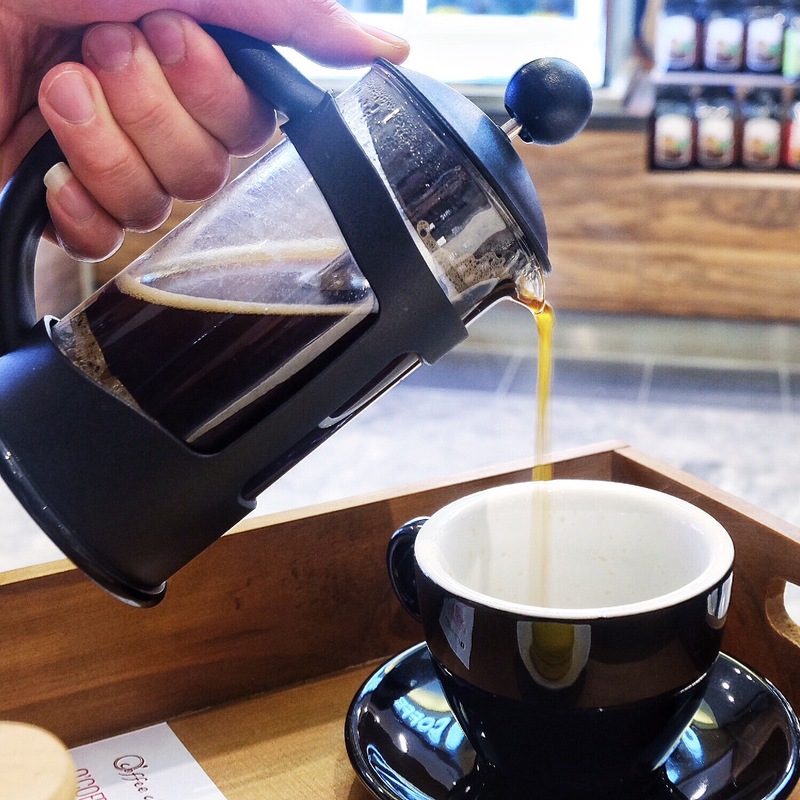 Choice of brewing style: French press, drip or Syphon Brew Coffee lovers, this is something that you shouldn’t miss out! To enjoy a good cup of coffee, an hour glass timer is given for you to experience the best taste of the coffee!